I have decided to share with everyone my favorite recipes. This is an easy recipe to follow and it is very quick to make when you do not have time to make anything too complicated. Enjoy! Marinate the chicken breast pieces in a bowl with the yogurt, ginger, garlic, red chili powder, lemon juice, soy sauce, and chicken spice mix. Marinate this for about 25 minutes. Then cut green pepper and slice onion and put it into pot with the oil. Saute the onion and green pepper from about 15 minutes. Then add the marinated chicken and cover and cook for about 30 minutes or until chicken is thoroughly cooked. For garnish add some cilantro. Serve with brown rice or some whole wheat bread. Add some salad on your plate for some extra fiber and a tasty addition. Low fat diets are pretty hard to incorporate in our busy lifestyle these days. As a stay at home mom it is especially hard for me!!! After having my second child I was very disciplined for the past 2 1/2 years, but lately I find myself slipping. Now that my 2 year old can eat cookies, cakes, chips, chocolate, candy etc...(you get my point) it is very hard for me not to enjoy with them. I am sure you are thinking...as a nutritionist she is keeping these foods in her house and giving it to her kids. I believe these foods are ok, but in limitation. They do get their full of protein, vegetables and all the essentials. but I think they are entitled to a dessert now and then. My point being it is hard to constantly keep an eye on what you are eating and how much of it, but we must do it! We must control what type of snacks and how much we are munching on throughout the day. In order to get an idea of what you are snacking daily, take a ziploc bag and instead of eating what you want put it in that bag. This will give you an idea of what you need to fix about your diet. Definitely do this because it will surprise you as how much snacking you are doing and on the wrong things. This will help you change your diet into a healthier one. Now take what you have found in that bag and replace your sugar cravings with a piece of fruit or a vegetable. This the best low fat snack you can have. Plus replacing those munchies here and there with a piece of fruit will prevent you from grabbing something every 20 minutes or so. Sugary processed foods do not sustain your hunger for long, but fruits and vegetables provide a longer feeling of satiety. Anything with fiber will take your body longer to digest and will make you feel fuller for longer. Remember also to eat every 2-4 hours to prevent blood sugar from dropping too low and leading to overeating at your next meal or snack. 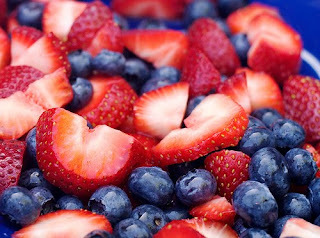 You can always have a bowl of fruit as a dessert if you are craving something sweet. To make that bowl of fruit even tastier add a little low fat whip cream with some dark chocolate chips on top. Dark chocolate chips are high in antioxidants and much healthier than milk chocolate. You should think of it in limitation though and not overdue the dark chocolate. It is healthy, but it has fat as well so too much cannot be healthy. But dark chocolate definitely satisfies that sweet tooth in a healthy way. I have discovered that pilates is a great way to lose the feeling of soreness after a strenuous workout. For those of you who love to workout, but feel the pain afterwards try Pilates!!! Pilates will help you stretch those muscles that are being overworked in your heavy cardiovascular or weight workouts. It will help you feel more lean and will also help some inches dissapear. You do not have to join a gym to take a Pilates class since there are many Pilates workouts that are available on dvd or even online! Even 10 min day or every other day can be beneficial. I have found a couple exercises that were online and I have been doing them for about 2 weeks and I can already see the benefits. My cardiovascular workouts seem much easier now since my muscles are not so sore. Pilates not only provides exercise for your body, but your mind as well. You are concentrating on controlling those muscles to increase flexibility, tone, and strength of your body. Currently many additional things are being used in the exercise of Pilates such as weights, medicine balls, and stability balls. This will just enhances the affect the Pilates exercise has on your body. Furthering the results of the Pilates exercise. So add a pilates workout into your exercise routine and you will definitely see the benefits. I think it is very important to read nutrition labels these days. Alot of the foods we eat now contain so many chemicals, food dyes, processed flour, refined sugars, and basically other ingredients that are not beneficial to your health. All these extra things that are added to the foods are basically added to increase the shelf life of them. This is why we need to stick to a healthy diet and concentrate on natural fresh healthy foods. For example today I decided to have my whole wheat waffles with some strawberries for breakfast. Now you would think that is the perfect healthy breakfast. It has the whole grains and the fruit it is just perfect. As you can the see the product says nutri-grain and also that it is made with 8g of whole grain! Well boy was I wrong! By chance I decided to read the label because most of the whole wheat products I was seeing at the store had unbleached flour or enriched flour on their ingredients label. Now technically this does not make the product 100% whole wheat anymore! This product is now a refined or processed food. The meaning of using enriched wheat flour is to increase the shelf life because waffle are found int he frozen section. So basically it is a chemical process that strips the wheat of its essential vitamins and minerals so it can last longer in the freezer. Now this causes the wheat to lose its most important nutrients and changes the whole process of its digestion in our system. Since it has become a refined or processed food it will digested very quickly in our system rather than the slowly complex digestion process that 100% whole wheat products should do. This is not healthy...if the product claims to be 100% whole wheat it should be 100% whole wheat....therefore I think I will have to start making my own homemade waffles from now on!!!!!!!!!!!!!!!!!!!!! So the point of this post is to reinforce the fact that reading nutrition labels is very important especially if you are concentrating on eating healthy. In my opinion the best time to workout will be in the mornings. It is good in the morning because it bascially is a great jump start to your day, in a lot of ways. When you workout in the morning you are setting up your body to burn calories for the rest of the day. When you exercise you are burning calories during and even after your workout is over. Exercise that increases your heart rate significantly, heavy aerobic exercise, can increase your metabolism. It is this increase in metabolism that gives the body the energy boost to keep burning calories through out he day. If you exercise in the evening, try to fit it in by 6pm. This will allow your body to keep burning calories for some time before you go to bed. Also, late workouts can interfere with sleep schedule because after working out you have so much energy it might be hard to fall asleep! However, if you are just doing some weight workout or yoga type stretching this might not interfere with your sleep patterns because it does not increase your heart rate as much. So try to get that workout done with in the morning and you will feel better throughout the day and keep burning some extra calories!!!! The Atkins diet has been a controversial diet. The effect of the Atkins diet on weight loss is positive, but its long term effects on the body itself can be detrimental. What is the Atkins diet? The Atkins diet is basically a diet that includes meats, cheeses (not low fat cheese), certain vegetables, and eggs. Its major point is that there is NO bread or fruits allowed! Now how are we obtaining are carbohydrates in this diet? We are not! I have worked as a nutritionist as well as done my B.S. in nutrition and I am completely against this diet because of the negative effects of not including fruits and grains in this diet. This diet can be debatable because it actually works. The weight does come off from eliminating the bread and fruits in the diet, but the lack of nutrients from the fruits and other vegetables that are forbidden on this diet can have negative effects on the body. If we are limiting our carbohydrates our body is using our stored fat as fuels and this can lead to ketone bodies. Our brain relies on glucose to function not ketone bodies. It can function on these ketone bodies produced, but only on a limited basis. The Atkins diet restricts the body of carbohydrates to about 20g per day. The normal amount of carbohydrate recommendation is about 150g per day. The breakdown of carbohydrates to fuel the brain is a much quicker way to receive the glucose needed for the brain to function. The breakdown of fats and proteins is a much slower process. If we include good carbohydrates such as, fruits, grains and vegetables it will be beneficial and not promote weight gain. But the Atkins diet severely restricts in fruits, certain vegetables, and of course grains for the first two weeks. After 2 weeks certain fruits and grains are introduced gradually, but not enough to provide the nutrients and vitamins the body needs. The Atkins diet focuses on high fat foods and low carbohydrate intake. High fat foods can have a huge impact on our cholesterol levels possibly leading to heart disease. All the cheeses are supposed to be regular cheese and not low fat!!! This does not sound healthy to me. There is no limit on eggs in this diet and eggs are very high in cholesterol. Although, I will not argue that eggs are a very good source of protein and iron, but 3-4 egg omelets a day is not healthy. As a nutritionist I do not condone this type of dieting due to so much of the negative effects associated with it. Personally, I think that a diet that includes healthy carbohydrates and that is low in fat can provide a good weight loss and a healthy weight loss. The Atkins diet claims that it was designed for those with heart problems and obesity. However, the high fat content and high cholesterol content does not seem like it would be a good choice for those with heart problems. My opinion on diets that promise rapid weight loss is that it just leads to "unsuccessful permanent weight loss." That is why I completely disagree with "detox diets." Detox diets claim that they promise weight loss in a short amount of time, but the weight loss is not permanent. What is a detox diet? A detox diet basically is a way of cleansing our system and that involves a strict diet regimen to clear our body of toxins that have accumulated from pollution, pesticides in our food, and alcohol. There are many detox diets out there and their basic purpose is to cleanse the system. Some detox diets will last 3 days and some will be 10 days, just depends what your purpose is on going on this type of diet. There is hardly any caloric intake because there is no food involved! This diet basically is a 10 day course. The laxatives help increase the process of the elimination of wastes from the body. (simply say causing diarrhea) Also, the warm water and salt will help with the elimination process. So from this I can definitely tell you the weight that you will lose is all WATER weight. After you resume your normal eating habits the weight will come back on fast. You may be wondering if this diet is used to cleanse our system, why is it so bad? Well, int he cleansing process we lose very important electrolytes and there is risk of dehydration. The most negative part of this diet, as I have mentioned, NO PERMANENT weight loss. In my opinion stick to a diet that is low in fat, low in carbohydrates, full of fresh fruits and vegetables, and also incorporate healthy grains. This type of diet does not promise rapid weight loss, but does promote weight loss in a gradual manner. When you lose weight gradually and in a healthy way the weight loss will be permanent. Also, you will have to incorporate an exercise regimen as well. If you exercise even 30 minutes a day or every other day it will help! Stay away from diets that promise a quick fix to a bigger problem.